Italian couture button from 1960's made and marked by Pavese. 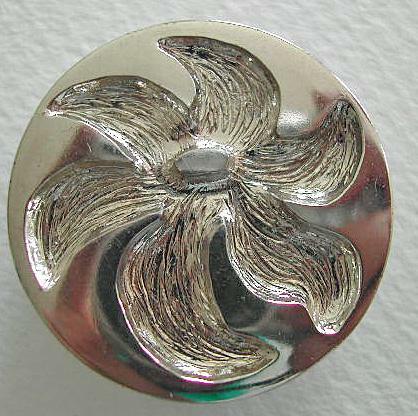 The button has a silvery colored top (metal or metalized) with a carved flower design, and a black plastic back with a wide tunnel selfshank. Size: almost 15/16 inch (30 mm); it is about 1/4 inch thick excl. the shank which is slightly domed.